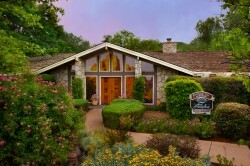 Creekside Inn is one of Sedona's premier Bed & Breakfast establishments. Situated right on the banks of Oak Creek, the Creekside Inn Bed and Breakfast is the perfect setting for a romantic getaway. Enjoy two acres of peaceful woods, lawns and creek. Or, a private tables in the Oak Creek view dining room that serves delicious three course gourmet breakfasts. Your hosts Tammy and Mark will provide unparalleled hospitality. Intimate candlelight dinners in your room or the dining room. Onsite massages by gifted massage therapists. A charming parlor with fireplace. Elegant rooms with beds fit for a king and queen. If you are considering one of the most romantic settings in Sedona for your stay. Creekside Inn Bed & Breakfast is among the best!